Following best-selling and award-winning books such as Black Hawk Down and Killing Pablo, Mark Bowden has won widespread acclaim for his ability to report true-life events in riveting detail, with a singular eye for human drama. 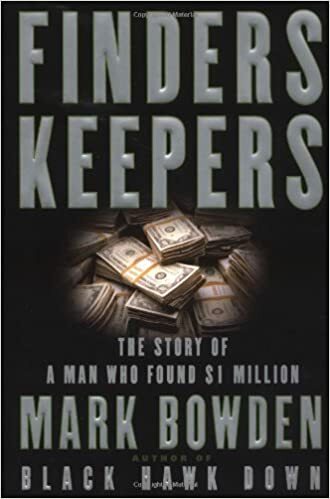 Now Finders Keepers recounts a mystery that captivated the city of Philadelphia when $1 million went missing. Hard times had left Joey Coyle -- a likable longshoreman from the close-knit working-class neighborhood of South Philadelphia -- living with his ailing mother and struggling to support a drug habit. One afternoon, Coyle was on his way to score drugs when, just blocks from his home, he found two curious yellow containers lying in the street. As it turned out, they had just fallen off the back of an armored van, and they contained $1 million in unmarked money from a casino. From the moment the cash disappeared, Detective Pat Laurenzi, with the help of the FBI, worked around the clock to find it. As the story exploded onto the front pages, the entire city was swept up in the hunt. Joey Coyle, meanwhile, shared the money with everyone from his girlfriend to complete strangers to the neighborhood's most notorious mob boss, who allegedly helped launder it. Coyle would live his next week in a drug-fueled whirlwind, planning his future as a rich man even as he grew terrified that he was about to be captured, even killed. Finders Keepers is the remarkable tale of an ordinary man faced with an extraordinary moral dilemma, and the fascinating reactions -- from complicity to concern to betrayal -- of the friends and neighbors to whom he turns. Loaded with intrigue and suspense, this is a gripping new book from a versatile and evocative chronicler of American life. Previous Post Previous Post: Captain Francis Crozier: Last Man Standing?